Bring a large pot of salted water to a boil. Add the broccoli florets and blanch just until crisp-tender, about 3 minutes; drain, plunge into ice water and drain well. Pat the broccoli thoroughly dry. Repeat with the cauliflower florets. Using a mandoline, slice the fennel paper-thin. In a small bowl, combine the 1 tablespoon each of chopped olives and capers with the lemon zest, mustard and garlic. Add the vinegar, then whisk in the olive oil. Season the dressing with salt and pepper. Pour half of the dressing into a large bowl. Add the cauliflower, broccoli, whole olives and capers and toss; let stand for 5 minutes. Add all of the remaining vegetables, season with salt and pepper and toss. Add more dressing if desired and toss again. 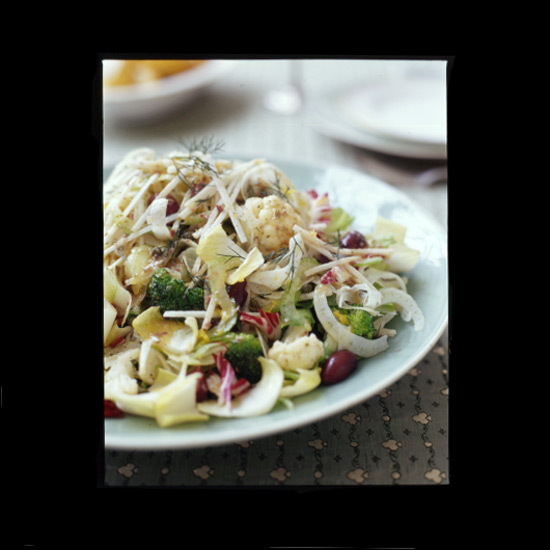 Garnish the salad with the fennel fronds and serve, passing the remaining dressing at the table. The salad can be prepared 1 day ahead; refrigerate the vegetables and dressing separately.